His book "Stories About Storytellers" is part tales about great Canadian writers combined with his memoirs working with those writers. 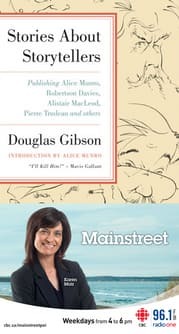 Douglas Gibson was one of Canada's foremost editors and publishers for more than 40 years. He's had a hand in the writing and publishing of Canadian writers Hugh MacLennan, Mavis Gallant, Alice Munro, Pierre Trudeau and Alistair MacLeod. Douglas Gibson recently gave a reading at the Confederation Centre Public Library and joined Karen Mair in the studio. The Confederation Centre of the Arts is the first of it's kind in some ways - and a meaningful beacon to architects. Marco Polo and Colin Ripley teach at the Department of Architectural Science at Ryerson University, and give a talk tomorrow about the Confederation Centre of the Arts, celebrating its 50th anniversary next year. Karen Mair talks with the two architects. 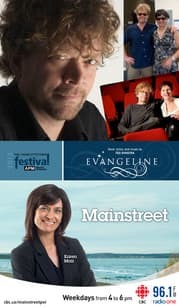 Ted Dykstra is an actor, writer and director... who took about 10 years to write the music, lyrics and book "Evangeline". Dykstra's Evangeline is now a new Canadian musicial, presently playing at the The Homburg Theatre in Charlottetown. 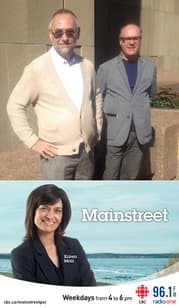 Ted submits to the Mainstreet Q-line.